The LPRCA has partnered with the USGS Nebraska Water Science Center over the past six growing seasons to collect, display, and analyze water quality data at sites on the Platte River and its tributaries. The data is generally collected from April through October and displayed in real-time over the internet. Temperature, turbidity, nitrate, specific conductance, suspended sediment, and dissolved oxygen are the current parameters that are available through the network. The goal of the monitoring network is to provide continuous, timely information to water users, managers, recreationists, and the general public. Additionally, it strengthens the amount and availability of water quality information to help us better understand the challenge of maintaining and improving the quality of water in the Platte River. In 2011, the LPRCA and USGS received a grant from the Nebraska Environmental Trust to expand the number and type of pollutants that are monitored. The grant focused on developing the ability to predict concentrations of selected pollutants at the monitoring locations under different flow conditions. 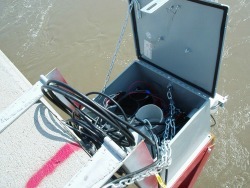 The predictive information will be available real-time through the water quality monitoring network website. A report will be available on the LPRCA website in Spring 2014.